Dr. Jon Matsumura‘s Aortic Imaging Lab performs an independent analysis of radiographic imaging involving different pathophysiology of the aorta including aneurysms, dissections, and traumatic aortic injury. Currently AortaCore provides pre and post-operative image interpretation and analysis for multi-center, prospective clinical research trials determing the safety and efficacy of medical treatments for aortic aneurysm and endovascular repair of aortic dissection, descending thoracic aortic aneurysms, and traumatic transections. AortaCore uses advance technology to provide objective processing of imaging data received as part of these clinical research trials. AortaCore provides protocol-defined image processing. Specifically we assess images for change in aortic anatomy as a result of treatment, device performance, and measuring parameters such as diameter and volume. Dr. Matsumura is also currently involved in multiple ongoing clinical trials involving treatment of patients with vascular diseases. His clinical area of expertise involves advanced percutaneous endovascular interventions for carotid stenosis, aortic aneurysm, aortic dissection, and peripheral artery disease. The Brown Lab focuses on exploring the nexus of pluripotent stem cell biology and immunology. We are currently investigating the mechanisms underpinning the immune response to autologous and allogeneic pluripotent stem cell (PSC)-derived cell therapies. Using transplantation immunology and genomics-based strategies, in conjunction with humanized mouse models, our goals are to 1) improve traditional organ transplantation outcomes, 2) gain new insights into PSC biology and immunology, and 3) enable curative regenerative medicine therapies. The research interests of Dr. Burlingham‘s lab include: 1) mechanisms of natural and induced forms tolerance to allografts, b) microchimerism and mixed chimerism approaches to tolerance, c) T cell biology, especially immunobiology of alloantigen- and tumor- specific T regulatory cells, and d) the role of collagen V-specific Th17 cells in fibro-obliterative diseases of heart & lung, and in lung transplant chronic rejection(OB). Dr. Connor’s lab aims to understand how physiological and structural properties of muscles and the central and peripheral nervous systems change with aging, surgery, diseases and disorders, and how these changes may influence properties of voice production, speech, and swallowing. The lab’s ultimate interest is the manner in which behavioral, medical, or surgical treatment may affect change in function and quality of life. Lab members have developed a research program within this overall framework that involves techniques from the basic sciences and human clinical sciences, especially in patient-centered research regarding perceptions of health quality and its measurement. Dr. Jiang‘s research focuses on objective pathological laryngeal function assessments, laryngeal physiology, biomechanics of vocal fold vibration, medical instrumentation, medical software development and application. This three-year study aims to improve communication between surgeons and patients considering surgery, so patients can make treatment decisions that are right for them. 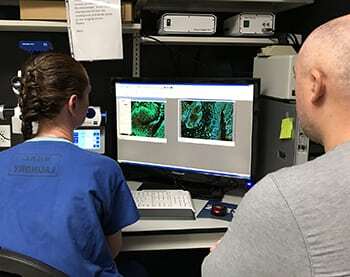 Dr. Odorico‘s laboratory team studies pancreatic lineage differentiation, including the differentiation of insulin-producing islet endocrine cells, from embryonic stem cells (ESCs) and induced pluripotent stem cells (iPSCs). The work is designed to address two critical needs. First is the need to generate an unlimited supply of functional insulin-secreting beta cells to be used to replace damaged beta cells in patients with diabetes. Second is the need for a cell culture model to study, specifically, human pancreas and islet development, given known differences between humans and lower organisms and the inability to study human organ development in vivo. In our work, we have developed an in vitro model of human pancreas development using a well-characterized protocol to differentiate pluripotent stem cells toward the pancreatic lineage. Using this model we are investigating the role of transcription factors, as well as intercellular and intracellular signaling pathways at different stages of development. We have also developed cell sorting techniques to simultaneously isolate foregut progenitor cells and eliminate the teratoma promoting ESCs from mixed differentiated stem cell populations. More recently, we are investigating the role of extracellular matrix (ECM) in regulating differentiation of pancreatic progenitors with our collaborators. We are combining innovative technologies in stem cell biology (generation of iPSCs and novel pancreatic lineage differentiation protocols) and matrix biology (perfusion and spin decellularization of tissues to produce pancreas ECM) in order to establish and characterize an in vitro system which can be used to study human pancreatic stem cell-pancreatic ECM interactions. Other projects involve using tet-Ptf1a cells, a unique cell line having inducible over-expression of Ptf1a, to investigate the role of PTF1a in pancreatic progenitor cell formation and its interaction with other transcription factors in pancreas development. Lastly, we are actively testing the ability of human ESC/iPSC-derived pancreatic progenitors to mature and function to regulate blood glucose levels in diabetic mice. Dr. Schwarze is a board-certified vascular surgeon and medical ethicist. She is a nationally recognized expert in surgical decision making, informed consent, advance directives and end-of-life care. 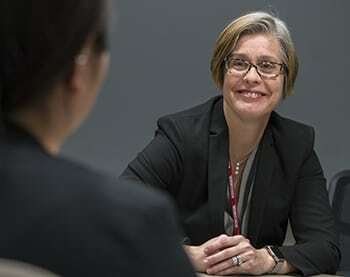 Her research focuses on improving communication between older patients and their surgeons, so that patients can avoid unwanted treatment and make decisions that align with their values, preferences and goals. Dr. Voils, social psychologist, uses qualitative and quantitative methodologies to study and improve treatment adherence. Her research focuses on identifying the psychosocial variables associated with treatment adherence, conducting randomized controlled trials to evaluate the effectiveness of behavioral interventions and measuring medication adherence. In this research, she employs a variety of quantitative, qualitative, and mixed methods designs. She has been the Principal Investigator of randomized controlled trials to evaluate the efficacy of a weight loss maintenance intervention; to evaluate the effectiveness of a spouse-assisted intervention for patient cholesterol reduction; and to evaluate the clinical utility of genetic testing for type 2 diabetes. The major focus of Dr. Yamanouchi’s lab is to understand the pathogenesis of abdominal aortic aneurysm and restenosis after angioplasty including balloon angioplasty and stent placement. Especially throught the calcium regulation in the arteriosclerotic disease. Arterial calcification, commonly associated with aging and atherosclerosis, has recently attracted significant attention in the research community. Arterial calcification displays features of the highly organized processes seen in bone formation. Bone homeostasis is a carefully controlled system relying upon a delicate balance between mineral deposition and resorption as mediated by osteoblasts and osteoclasts, respectively. The presence of osteoclast-like cells (OLCs), which are derived from the monocyte/macrophage lineage and share osteoclast features such as the ability to dissolve extracellular matrix, has been noted in calcified arteries. Calcification is seldom considered a major feature of abdominal aortic aneurysm (AAA) and thus has remained a poorly explored avenue of study. This grant is aimed to explore the role of osteoclastogenesis, the development of OLCs, in AAA. They are also devoted to the development of novel materials for vascular bypass graft and gene delivery method to treat the patients who suffers peripheral arterial disease.